Now that you’ve set-up your Google Ads Grant account (if you haven’t, read through our guide on how to apply for your ads grant account), it’s important that you get as much out of it as you can. We’ve put together the 6 ways to get the most out of your Google ads grant account. Correctly structuring your account is crucial for success within your Google Ads grant account, and more importantly, it’s easy to do! A well-structured account will make it easier in the long run to manage your ad campaigns and makes the day to day running of your campaigns a lot easier. It also allows you to allocate budget to areas which are most important to you, as well as understanding which areas are driving the most valuable actions (conversions). One easy way of structuring your account is to follow the structure of your site. This isn’t to say you need a campaign for each section on your site, remember to think about your goals for using Google’s Ad Grant, you will know where you want to spend your Google money. You want to show an ad which conveys this message clearly and directs to the most relevant page. If you don’t set up a good account structure, this can be difficult. As you can see, each of these search terms is completely different and requires different messages. One thing you don’t want is people clicking on your ads even though they are not interested in your charity, therefore wasting your budget. There are a few ways in which you can combat this irrelevant traffic. Firstly, only use relevant keywords – you know your audience better than anybody, you know what they are looking for and you know how they find your business. Use this knowledge to build your keyword groups and don’t just use what Google may suggest. Also, if you are a bidding on a keyword that a ‘non Google grant’ account is bidding on, you will nearly always rank below, so try staying away from generic, ‘catch-all’ keywords and try using ‘long-tailed’ specific keywords as much as you can, without compromising overall ‘reach’. Secondly, you should add ‘negative’ keywords. These aren’t keywords that are designed to make us feel bad. These are search terms that you can block so that when someone searches these keywords, your ads will not show. For example, if you don’t want to advertise for jobs, you could add ‘jobs’ as a negative search term to your brand campaigns. Thirdly, you must be using geo-targeting to comply with the guidelines (this is good for avoiding irrelevant traffic), if you are a local charity you can choose to only target your local area. Another thing you can do is add negative locations, for locations that you specifically don’t want to target e.g. You cannot offer your services in Ireland, so you would add Ireland as a ‘negative location’. Your ads are your shop front. When people search for something, they are looking for EXACTLY that – so use that keyword in your ad where possible and suitable. Make your copy easy to understand. Like we mentioned before if someone searches for ‘fundraising for homelessness charity’ you want to show an ad which conveys the message ‘Fundraise For Homelessness Charity’ and directs to a page all about ‘fundraising for a homelessness charity’. Try to include CTAs (call to actions) in the ad – this will also help filter out irrelevant traffic (saving budget!) – adding a call to action tells the searcher what you want them to do on the site. 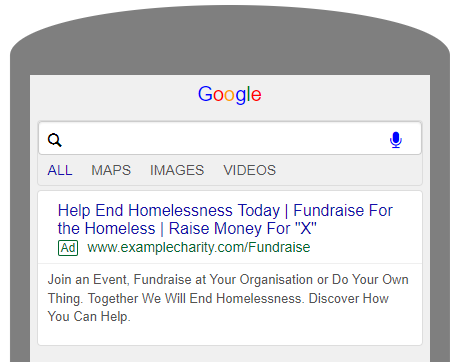 Using the example above, in the ad about ‘Fundraising for a homelessness charity’, you would want to add a CTA somewhere giving searchers information about how they can go about fundraising for you, e.g. ‘Join Our Fundraising Email List’ or ‘Check out our fundraising events near you’. Include USPs (unique selling points) to make you stand out from the competition – why should people fundraise for you, why should they donate? Show how they can make a change. Utilise ad extensions; firstly, because they widen your ‘real-estate’ (space on the search results page), but also because they can store extra information which helps improve the CTR of the ad. Adding Sitelink extensions enables you to add different pages of your website to the ad, adding a Call extension allows people to contact your charity directly from the ad & Location extensions can help users find your charity. On top of this, Google enforces Google Ads Grant accounts to have AT LEAST two Sitelink extensions active. Make sure your prospective donors are sent to a page of your website which relates to the ad they have clicked. Try to direct users to a page where they can take action – it doesn’t make sense to make people search for the content or information they are looking for. Direct them straight to it and not just to the Homepage. One company found their ad-specific landing pages outperformed their generic pages by 115%. And companies have seen a 55% increase in leads when increasing their number of landing pages from 10 to 15. What is the overall aim for people in each campaign? You may use a ‘Fundraising’ campaign to drive fundraising support, you may use a ‘Brand’ campaign to drive donations or you may use a ‘Volunteering’ campaign to promote volunteering opportunities. In each case you should have these goals set up in your analytics and linked to your Google Ads account – this will enable you to optimise your account. With conversion tracking set up you can see exactly where people are coming from and which keywords are ending up in meaningful actions, therefore allowing you to spend more on these areas and pull back on areas which aren’t performing. If, after a 30-day period, you find that some ad groups are performing well (minimum 30 conversions within that time period), you could make the switch to target CPA bidding (tCPA). tCPA bidding will automate the bidding strategy for you by analysing your conversion data and deciding when, and how much to bid to get the most conversions. Be wary with this bidding strategy, as it can overspend and underperform if not monitored! We would advise sticking with manual bidding unless you are generating a good volume of conversions in a very short space of time, otherwise, there is just not enough data for the algorithm to work with. This is the worst thing you can do after setting up your account. Even if you believe you’ve set it up perfectly, followed a good account structure, created relevant and engaging ads and keyword groups and found good initial results, you still want to constantly monitor the account. You always need to optimise based on performance. You may identify keywords that are spending way too much of your budget and not converting well – these need to be removed or at least decrease your maximum CPC on them. Watch out for errors with your account; sometimes ads can be disapproved for several reasons and staying on top of these is vital. There are also certain rules you need to meet to comply with the Google Ads Grant guidelines. For example, your account needs to be above at least 5% CTR (brand campaigns help sticking to this) and you can’t have keywords with a quality score 1 & 2 – so a regular harvest for low quality score keywords is important! Talk to us today about how we can help your charity. Tom is our Digital Marketing Executive. resident Liverpool FC lover and office ping-pong champion. Occasionally plays at open mics within a walking distance of his flat.